"[This is] the most comfortable [I've felt] since coming to Germany." "Was even better than I expected it to be. :))". "[My expectations] were more than met. I was very impressed with the useful information presented." I've already had enquiries for a follow-up, we'll certainly keep you informed! Moving to a foreign place when your partner accepts a contract for a new and demanding job can, at times, be twice as hard on the you. You may have been busy fixing up the new home, your partner has new challenges and new colleagues, possibly your children are at school making new friends and once you are all 'settled', do you find yourself saying "now what?" It's not easy finding your way around a new place when you've left your friends and family behind, you don't speak the language and you find yourself at home alone. Just don't despair! Düsseldorf has so very much to offer and we are here to help you find it! The International School on the Rhine in Neuss, (ISR), and RhineBuzz have come together to offer you a fun-filled day where you can meet folks in the same situation as yourselves and discover much that there is to enjoy and share in Düsseldorf. Our workshop will be packed with guest speakers including the director of the Tonhalle and director of the forthcoming Schumann Fest, Michael Becker; Peter Inhoven, gourmet butcher extraordinaire who will explain all those weird cuts of meat; yoga with our wonderful instructor from USA, John Vilardo; Driving School Ludwig will let you know that you can learn to drive here too; we will have speakers on activities to do with children and information on where to shop when the crazy German closing times leave you stranded. 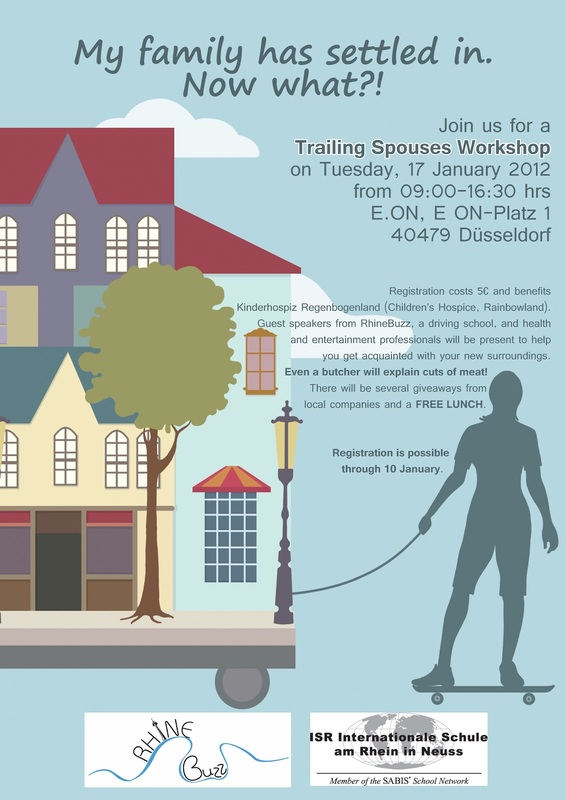 There will even be a talk on communication in Germany and how it might differ from what you are possibly used to. There will be so very much in this day that you can use in a most hands-on way and of course I'll be adding a few words about filling your social calendar! Giveaways include a chance to win tickets and vouchers from Düsseldorf Marketing and Tourism, the German Opera on the Rhine, Museum Kunstpalast, Champu Stylists, the Schumann Fest and the Tonhalle. A donation of €5 to the Children's Hospice Regenbogenland is requested. 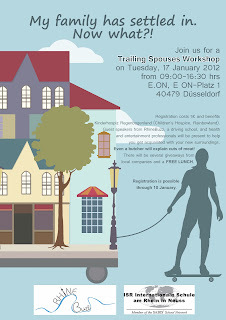 adding "Trailing Spouses Workshop" as a reference.